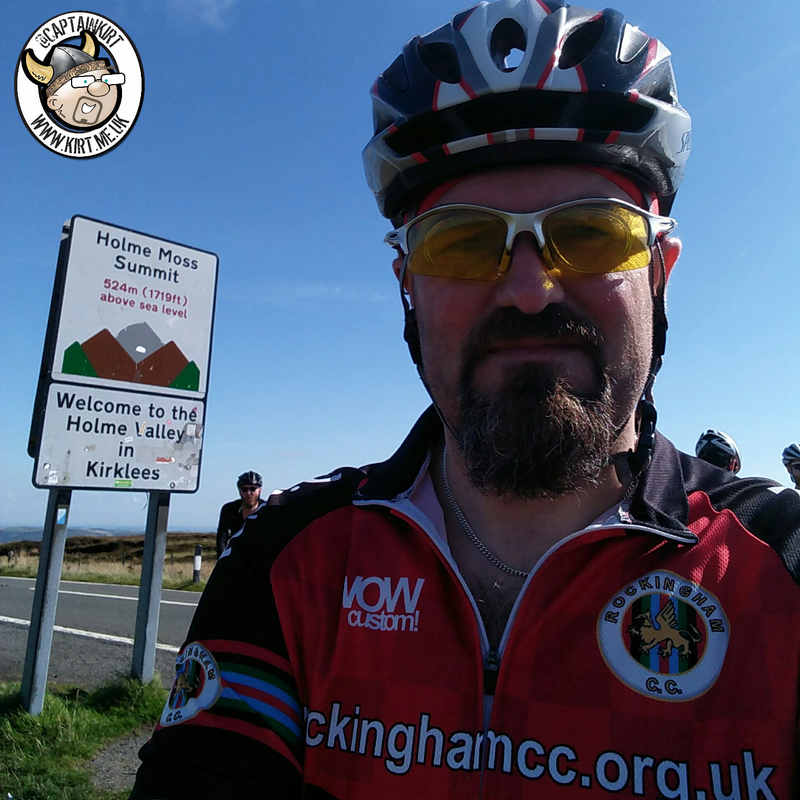 Last year I did the 65 Roses Holme Moss Classic Sportive because I needed a challenge to help me come back from an injury. This year I just wanted to experience what I did last year. There were no closed roads at the start for this year's ride so a mass start was out of the question for safety reasons. This meant that the start was a lot more subdued than last year. My preparation for this ride has been poor and coming up to it I was a little apprehensive. Would I get round the course? Would I get up to the summit? It seemed like forever riding out to get to to the exposed moors. It's then I first see the transmitter perched on top of Holme Moss. It doesn't look all that bad from here, I knew looks could be deceiving. My legs are already aching from the ride so far. When I arrive in Holmfirth, which some will remember as the location setting for the geriatric TV comedy "Last of the Summer Wine", I know the start of the main attraction isn't far. The hard climb through Holmbridge fools many into thinking that the main climb has started but this is just a prelude to the main event. It's here you first see your adversary in all it's glory. 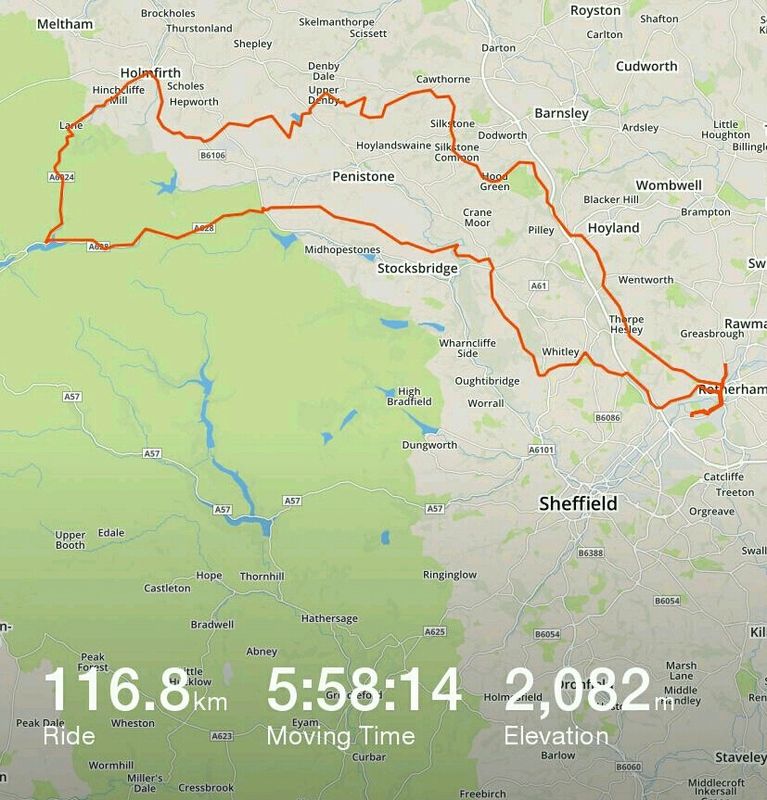 There's a slight rest bite before the main climb kicks in. It's time to give my all. The trick is to just slug away at it gently, keep it moving even when it feels like it's never going to end. There's a car park at the top. Many see it (as did I last year) and think it's the summit. It's not. There's still a bit left although the gradient eases off. I did it. I made it to the top of Holme Moss. I treated myself to a small cake which I'd picked up at the feed station earlier. My legs were like jelly but I was only just over half way. 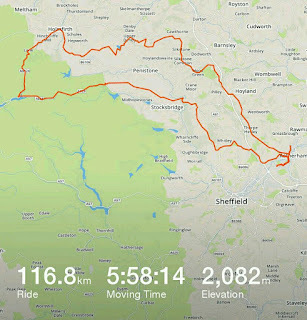 Next was a massive decent followed by a long slog along Woodhead Pass. The road back wasn't smooth, there were still some climbs left. I picked up the pace on the last leg and it wasn't long before I was in Sheffield. As I hit the last 5k I started to cramp up in my legs, I though I was going to have problems but I managed to ride through. I arrived back and caught up with my club mates to compare notes. It was an amazing day, hard work but worth every minute.